GEORGE KOLLIAS is the world-class drummer of legendary death metal band NILE. On 'Invictus', his debut solo album, the Greek drum progeny unleashes a crushing death metal assault. Tracks such as "Shall Rise, Shall Be Dead", "The Passage", and "Treasures of Nemesis" are easily as strong as anything from the established genre titans. 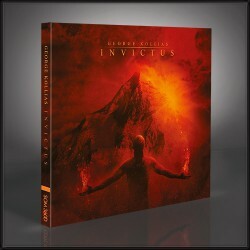 'Invictus' features Kollias' exceptional work across all instruments, as well as guest spots from members of NILE, ROTTING CHRIST, FIREWIND and more. Far more than a solo-album vanity piece, 'Invictus' deliver classic, timeless death metal.